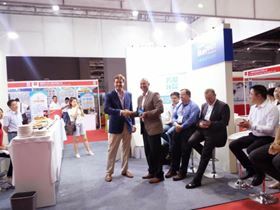 PaveDrain chief executive Doug Buch accepts the 2016 China BlueTech Award for China Market Readiness from John Robinson (l), principal consultant, Mandarin Environmental. OriginClear and PaveDrain competed against a field of 30 water and wastewater technology companies from Europe, Israel, and North America, all focused on demonstrating their technology’s readiness for China market. Entrants included a wide spectrum of small and large capitalization companies with solutions across key industry submarkets, including industrial, municipal, biosolids, and stormwater. The judges were impressed by OriginClear’s advanced water cleanup technology, Electro-Water Separation™ (EWS), which is based on electrochemistry and will tackle China’s most recalcitrant type of pollutants. Scalable, with a low operational cost, it will be incorporated as a modular add-on to existing water treatment sites in China or built as a standalone process flow. PaveDrain’s solution for stormwater also captured the attention of the judges. The PaveDrain® system was created under the premise of allowing stormwater runoff from streets, roads, roofs and parking lots to quickly infiltrate into the ground. This places less stress on the sewer systems, can help reduce localized flooding and helps water infiltrate back into the groundwater table. Following over three years of research and development in North America, PaveDrain is now strategically aligning with China’s Sponge City initiative to bring its infiltration system to China.